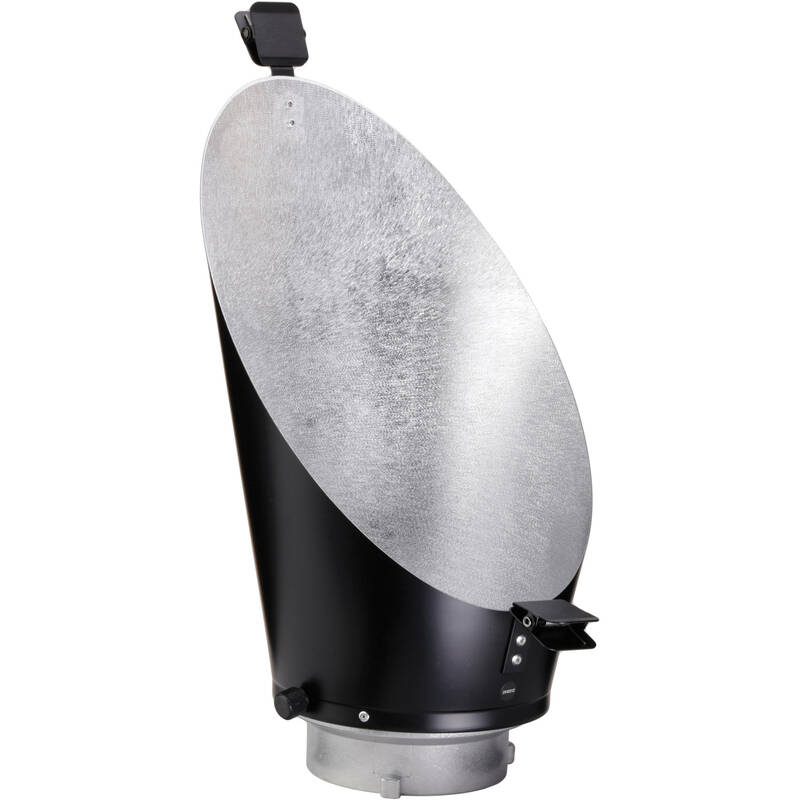 This Impact Background Reflector for Impact/Bowens Mount Strobes is a sconce-shaped light modifier that outputs an oval, fan-like beam of light that is ideal for placing behind the subject for even lighting of the background. Alternately, you can place it closer to the background for a corona or graduated effect or backlight the subject to separate him or her from the background. The reflector has handy clips to attach gels and diffusion material and a rotation mechanism that allows you to vary the direction of the light. The Background Reflector is compatible with Impact Monolights, Bowens, Travelite, Cowboy, Interfit Stellar, JTL, Photoflex, Rime Lite, and Westcott flash heads. Box Dimensions (LxWxH) 16.25 x 8.85 x 8.75"
Background Reflector for Impact/Bowens Mount Strobes is rated 4.7 out of 5 by 3. Rated 4 out of 5 by Eoin from More control than small umbrellas Bigger than I expected from the pictures and perhaps a bit flimsier than would be ideal, but functionally very good. Rotates easily without any sticking or binding, which is usually the case with alloy on alloy. Comes complete with integral Bowens S type speed ring adapter so one less thing to have to buy - possibly why this is slightly more expensive than I might otherwise have expected from Impact. Also has integral clips for gels, which although not my thing is good if you're more into fashion, etc. I suppose you could modify them to attach further light spill modifiers if necessary. Rated 5 out of 5 by Robert Mitchell Photography from Perfect For Background Lighting I've used this background reflector for portraits and for subtle effects in glamour and beauty. This reflector gives me some interesting options that standard reflectors don't, and I really like the effects I get when bringing the light in at an angle from side. Having clips mounted right on the reflector makes it super easy to add gels and diffusion. Nice addition to the standard reflectors I normally use. Rated 5 out of 5 by Dottie from Great for Background Lighting I absolutely love this reflector!! I use this reflector in studio for portraits and other assignments and the attached clips make it great for attaching color gels for great effects. Will this fit the Impact SF-ABRL160 monolights? No, the Impact Background Reflector for Impact/Bowens Mount Strobes is not compatible for use with the Impact SF-ABRL160 Stand Mount Flash. The Imact Backgrond Reflector is only compatible with light fixtures that have a Bowens S-mount. The Impact SF-ABRL 160 has a proprietary mount, and would only be compatible for use with the Impact Barndoor Kit for SF-ABRL160 Flash, B&amp;H # IMBDSFABRL, or the Impact Snoot for SF-ABRL160 Flash Head, B&amp;H # IMSSFABRL. Is it suitable for S-type bracket? Yes, the Impact Background Reflector for Impact/Bowens Mount Strobes is designed for use on light fixtures that use the Bowens S-mount connector for light modifier usage. what size gel does this need? You can use 10 X 12 inches gel like the Lee Filter Pack. Will this fit the Impact VC-500WL 3-500Ws Monolighs?